If you’re shooting speedlights, chances are good that you’re going to be looking for stands sooner or later. Since speedlights are lightweight, you really don’t need air cushioned stands. One of the things that speedlight shooting exemplifies is the portability aspect of adding light to your images. The key word is portability. Look for two things: 1) stands that are compact when folded up— look at the folded size. 2) the fully extended size. Many stands will extend higher than 7-8 feet but they are not compact when folded.Some only extend to 6 feet. That’s fine if you’re doing tabletop or macro work but what happens when someone 6’3″ happens to be your subject? The CheetahStand C8 folds to 28.5″ and extends to 8′. That’s a decent collapsed size and extended height. The function is that it will automatically fold up when you pick it up with one hand. That allows for easy portability placement. Particularly if you are shooting on location and moving around frequently. I use Lowel Uni TO stands. They are one of the most compact stands on the market. Their folded size is 21.5″ folded and they extend to 7’11” That is extremely compact for that size extended. I’ve carried one in a backpack, thrown one into my suitcase when traveling and find them very lightweight at 2.4 lbs. I also have an extension so I can extend past the 8′ mark if needed. Not all stands are created equal. Buy smart, buy once. Did you get your camera or lens for Christmas or Hanukkah? If you’re still doing homework or thinking about your next acquisition, you might like to have a whirl at what lenses give you what viewpoint on an FX or DX body. Nikon has a Nikkor Lens simulator online. How wide or long a reach gives you what angle of view? It will differ from an FX (full frame) or DX (crop) body. Interesting tool! Interesting to note how digital imaging in both still photography and video has become so mainstream since the entry level of consumer electronics has dropped in price. A compact camera in every pocket! Harbinger for more Photoshop disasters ahead. While we know that the media expects to cover an event, they cannot possibly be everywhere. Print publications have all been steadily moving to an online format, even if they do maintain a hardcopy subscriber base, they still have a presence online. It also generates a FedX mentality on demand for the here and now breaking news. 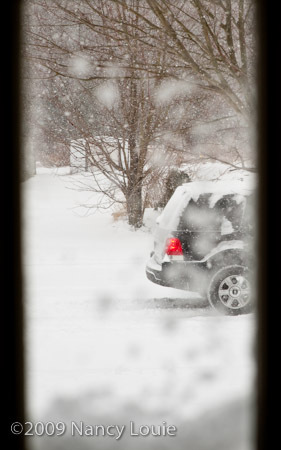 We’re getting buried here under a major snowstorm in the MidAtlantic in the U.S. The weather is a changeable beast. How would you cover that in every corner? Crowdsource it. Crowdsourcing as a term was coined by Wired Magazine in 2006, but it’s been going on long before that. Is it the death knell of photography? Video? Certainly not. However, it shows how the Internet has affected our society for the changing morays of distribution of content. Audiences still expect rich media content no matter where they look. What looks great at 72 ppi doesn’t look so good at 300 ppi resolution. But that’s for another discussion. Photo shown above taken through my sidelight front door. It’s snowing like crazy here. Dec. 2009 issue of Progressive Farmer magazine has published. DTN licensed the image from me back in the early fall for this issue. I was found through a photo credit on another publication (and this blog). The shot was taken in Virginia Richmond area. 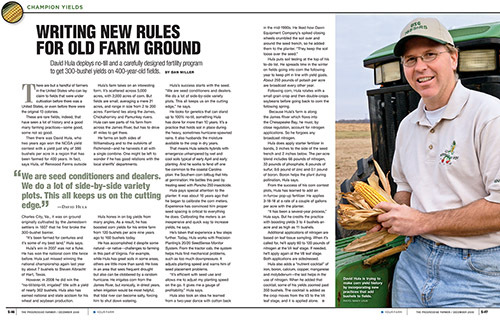 I was shooting corn in 4 states for the front cover of another publication. Here’s the electronic double spread version. It’s a trade publication so subscribers get the hard copy. I mentioned in a previous post about PicScout’s ImageExchange tool. I was approved to download and install but I was busy. They bugged me via email to install so I did. Wow I’m impressed. I dropped into Google Images to check it out. Did a search for Christmas Tree and a bunch of images cropped up. There is an “I” icon/logo that appears in your toolbar (as active and working) and next to the image if it is in the registry. You have the option of clicking on the “I” in the Google search results or clicking directly on the image. I clicked on the image itself and it took me right into Flickr. I could see that the image was on Flickr, the maker and copyright information, rights usage. It was free to use with restrictions that it not be used for commercial purposes. If you buy or use images, I think this is a good way to find them along with the data needed to license or use. It’s also a boon to those of you who post images on Flickr among other places where they are displayed for purchase of licensing. Creative Commons licensing is common on Flickr but if you wanted to license from the photographer, there may be options. Dreamstime images are also showing up in the Google Images searches with a “License Now” that takes you right into Dreamstime’s website. It’s a Firefox 3 add on to your toolbar. Mac or PC. It’s free (you need approval from PicScout to download/use) and it’s in Beta at this time. I’ve been a fan of CreativeTechs since their first free webinar on Photoshop (Feb.’09) and I have posted information about their free classes on my blog. They have expanded their courses by a lot. Not just about the software but more. It is nice to see this taking off. Kudos to Craig Swanson and Jason Hoppe. Craig listens to his audience to shape the class offerings. Suggest a class here! There is an upcoming 5 week studio lighting course. Rosanne Olson is the instructor. There’s also a watercolor painting class Dec. 18. The expanded courses even include one for building iPhone applications (currently in session as of this writing—class 3 is Dec.15) and a Photoshop scrapbooking course. If you’re shooting stock, you should sit in on their RetouchLIVE Thursdays. Live demonstrations of how to tweak your images. Jason Hoppe, who is Adobe Certified, conducts this one. He’s an entertaining presenter and Photoshop guru. Images are emailed to Jason for consideration to use in the class so this is real world, hands on usage. Pragmatic! If you think you know it all, I think you will be in store for some nice surprises. Sign up so you will be notified by email when the class begins. Certain classes draw a large audience so you may want to sign up early. It is the real deal that the classes are free and they are live. If you’re a busy person and think that you may miss a class, you can purchase a single class or get the entire course in download form for nominal prices. As winter sets in where I live, my thoughts of making images turn to inside locations due to the cold weather. That also brings some other introspective thinking in regards to creative content. We’ve all fallen into the traps of believing in how our gear might “do something” for our photography. A designer normally doesn’t think like this unless it’s in terms of software lust. However, any designer can tell you that as a pro, you learn to jump start your thinking in order to meet deadlines. So, what do photographers do? Have you developed ways to jump start yourself? Photography is creative no matter how you look at it. I love looking at the direct mail product catalogs that are bursting in my snail mailbox. Many of them like L.L. Bean will mimic stock depictions even if they are product catalogs. Harry & David has some beautiful shots of foodstuffs in their catalogs. Make sure you don’t ignore what’s under your nose for inspiration. I’ve had the Idea Index book by Jim Krause for years. It was great for a design jump start. 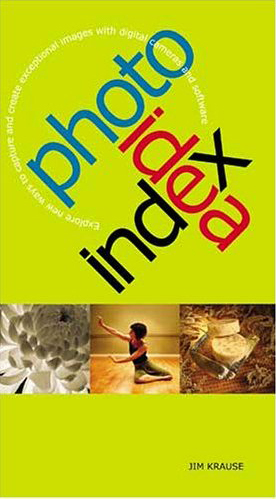 Did you know that he’s also published a Photo Idea Index book? What’s it going to do for you? It won’t meter your light or sharpen your stuff, but it will ignite the spark for thinking about the making of your images. It matters not how technically proficient you are if the image lacks for artistic content. Krause has demonstrated this clearly by using visual examples from a point and shoot and mid range DSLR body throughout his book. There is no attempt to tell you how to make the specific image, but it will point you in a direction by varying your ways of thinking via composition, viewpoints, color, leading lines, light, etc. It’s much cheaper than an 85 f/1.4 portrait lens. If it doesn’t magically appear under your tree, then you should gift it to yourself. An easy read and good alternative to gear buying in a tight economy.